The AMS Multi-Loc System makes setting your production run faster. It is as easy as picking up the stainless steel stop and pressing it down at the dimension you want. The Multi-Loc Stops allow you to to set stops at various lengths to enable you to maximize your raw stock without changing your set-up each time. These Multi-Loc versions of the AMS Gauging Systems allow you to place multiple stops on the rail as close as 1" apart on the Standard System, and 1 1/2" apart on the Heavy Duty System. Three stops come with each assembly and either system is available in Left-Hand & Right-Hand models. Additional Multi-Loc stops are available. To operate, simply set the stops to your cut list dimensions. Slide the material past the stops you do not want to use, right to the desired setting. Press the material against the fence and the flippers on the stops not used will move away. 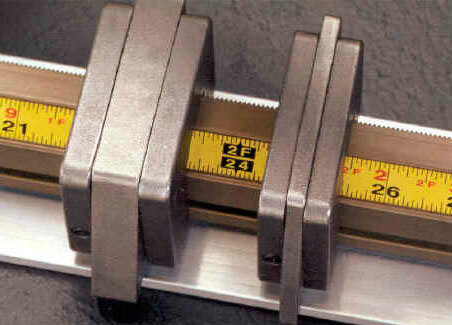 Multi-Loc Systems are available in 1/16" increments and in standard lengths of 2', 4', 6', 8'. 10', & 12'. Longer lengths can be achieved by joining rails together.